The purpose of our study was to organize the literature regarding the efficacy of modern videolaryngoscopes in oral endotracheal intubation, then perform a quality assessment according to recommended external criteria and make recommendations for use. Inclusion criteria included devices with recent studies of human subjects. A total of 980 articles were returned in the initial search and 65 additional items were identified using cited references. After exclusion of articles failing to meet study criteria, 77 articles remained. Data were extracted according to the rate of successful intubation and improvement of glottic view compared with direct laryngoscopy. Studies were classified according to whether they primarily examined subjects with normal airways, possessing risk factors for difficult direct laryngoscopy, or following difficult or failed direct laryngoscopy. The evidence of efficacy for videolaryngoscopy in the difficult airway is limited. What evidence exists is both randomized prospective and observational in nature, requiring a scheme that evaluates both forms and allows recommendations to be made. In patients at higher risk of difficult laryngoscopy we recommend the use of the Airtraq, CTrach, GlideScope, Pentax AWS and V-MAC to achieve successful intubation. In difficult direct laryngoscopy (C&L >/= 3) we cautiously recommend the use of the Airtraq, Bonfils, Bullard, CTrach, GlideScope, and Pentax AWS, by an operator with reasonable prior experience, to achieve successful intubation when used in accordance with the ASA practice guidelines for management of the difficult airway. There is additional evidence to support the use of the Airtraq, Bonfils, CTrach, GlideScope, McGrath, and Pentax AWS following failed intubation via direct laryngoscopy to achieve successful intubation. Future investigation would benefit from precise qualification of the subjects under study, and an improvement in overall methodology to include randomization and blinding. Since Macintosh  (1943) and Miller  (1941) envisioned and developed their direct laryngoscopes attempts have been made to improve on these techniques and equipment using technological advances. Nevertheless, these original techniques have withstood the test of time and remain the mainstay of intubation globally. Direct laryngoscopy (DL) relies on the formation of a “line-of-sight” between the operator and the laryngeal inlet, success reliant on careful head positioning and consistent anatomy. When these conditions are not met, for example in poor tissue mobility, limited mouth opening, or enlarged tongue, the failure rate of intubation with conventional direct laryngoscopy increases [3–5]. Videolaryngoscopy (VL) is a relatively recent development that attempts to improve the success of tracheal intubation. High-resolution micro cameras and small portable flat-screen monitors are used in an attempt to improve upon the view and success rate of direct laryngoscopy. Similar technologies have been successfully applied to other fields of medicine such as laparoscopic and robotic surgery, making new techniques and procedures possible . The use of Videolaryngoscopy produces a view of the laryngeal inlet independent of the line of sight, particularly when an angulated device is used. This may free them from some of the conditions essential to the success of direct laryngoscopy. There is an assumption that improved lighting and a better view can improve the success of laryngoscopy. This may be incorrect as an improvement in success may be limited by both use of unfamiliar equipment and difficulty placing an endotracheal tube out of the line of sight. Some previous reviews have indicated an advantage when using videolaryngoscopy [7–9] but a need remains for an systematic evidence based review of the efficacy of videolaryngoscopy above that of direct laryngoscopy. To appreciate any benefit from the use of videolaryngoscopy we need to appreciate the mechanism and incidence of failure of direct laryngoscopy. The incidence of difficulty encountered during direct laryngoscopy is difficult to ascertain as it depends upon both definition and patient selection. The best evidence available is from a meta-analysis of 50,760 patients in which difficulty at laryngoscopy occurred in 5.8% (95% CI 4.5 – 7.5) of subjects . Of note, the metanalysis did exclude all patients whose airways were “anatomically abnormal” or in whom DL was thought inappropriate. The definition of difficult laryngoscopy was broad and included all subjects with Cormack and Lehane views 3 or greater. The actual incidence of difficult intubation in this difficult laryngoscopy group is presumably less than 5.8% as many patients with a Cormack and Lehane view 3 can successfully be intubated with direct laryngoscopy and the use of a gum elastic bougie by a reasonably experience practitioner. However, even given this broad definition of difficult laryngoscopy, this still suggests an impressive overall intubation success rate of >95%  for direct laryngoscopy among patients thought to be suitable for this technique. It is this high standard against which the new methods of videolaryngoscopy must be assessed. Pubmed and Cochrane review searches were made of all published articles regarding Video Laryngoscopy (VL) from 1999 to April 2011. The following search terms were used: Airtraq, Berci DCI, Bonfils Fibre(er) scope, Bonfils Intubation, Bullard laryngoscope, C-MAC, C-MAC D-blade, CTrach, video laryngoscopy, EVO videolaryngoscope, GlideScope, Glidescope Direct, LMA CTrach, McGrath laryngoscope, McGrath MAC, McGrath series 5, Pentax Airway Scope, Pentax AWS, Rusch, Shikani, Storz Berci, Storz CMAC, Styletscope, V-MAC, Upsherscope, WuScope. X-Lite. Additional search items, for classification purposes, were cervical, cervical limitation, cervical stabilization, obesity, difficult intubation, failed intubation, failed ventilation and education. From this selection all articles were reviewed including randomized controlled trials, observational studies, review articles, meta-analyses and editorials. Bibliographies were checked manually for any relevant articles. Articles published in the ASA meeting proceedings were included and a search made of all ongoing clinical trials in Clinicaltrials.gov. Procedure performed by trained operators. English language or accessible translation of key outcomes and methodology. Device had at least 10 articles published on its use during the previous 5 years (until April 2011). Studies of patients aged less than 18 years. Duplicates, unrelated studies, abstracts, single case reports and small studies (less than 5 subjects). An overall measure of study quality (based on SIGN recommendations ). Number of subjects in study group. Number of predicted normal airway (eg MP 1/2). Number of predicted difficult (eg MP 3/4). Number of difficult direct laryngoscopies (known or C&L >3 on Mac DL). Improvement in laryngeal view compared with direct laryngoscopy. Average time to intubation. Expressed as central tendency (Mean or median) and variability (95% confidence interval or Inter Quartile Range). Success rate (percentage) on 1st attempt and overall success (OA). 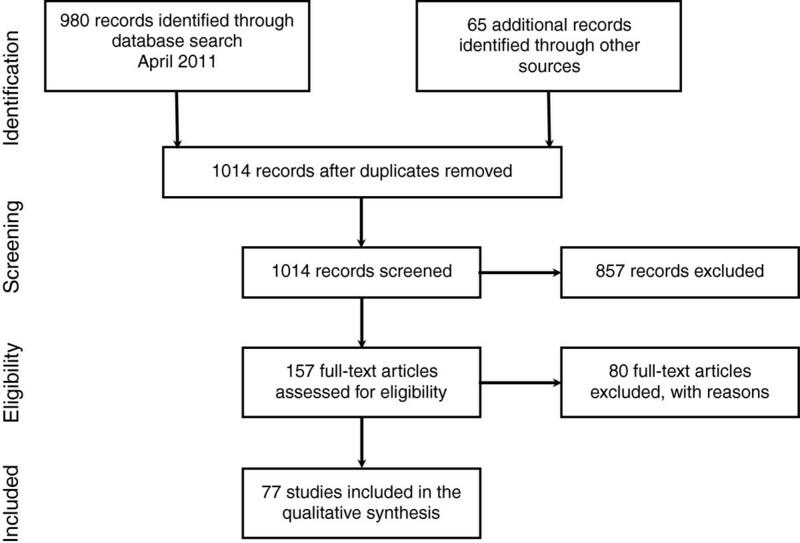 A total of 980 articles were returned in the initial Pub Med search and 65 additional items were identified using references cited in these articles. After exclusion of articles failing to meet study criteria, 77 articles remained (Figure 1, Tables 1, 2 and 3). Information flow through the systematic review. (Refer to Table 4 for guide to quality assessment grading). When considering the wide variety of airway devices currently available, it is impossible to perform a systematic review of all. With this is mind we limited our review to videolaryngoscopy and applied a rigid, objective inclusion criterion (that of at least 10 publications in the last 5 years) in an attempt to make the selection contemporary. No performance assessment of such a diverse group of devices will ever be perfect, but we have attempted to limit through our objective inclusion criteria those devices that have received the most recent development and where competition exists between different versions of similar equipment. The dynamic nature of the field is illustrated by the decision to discontinue the manufacture of the CTrach by LMA North America in December 2009 during the period of the review. However, the CTrach is still in clinical use and fulfilled the study inclusion criteria so remained in this systematic review. The main technique excluded from this review is flexible fiberoptic bronchoscopy. We feel this method has a specific clinical application and is difficult to compare with standard direct laryngoscopy. The inclusion criteria limited the choice of devices to the GlideScope, V-MAC (including C-MAC and Storz Berci DCI), Bullard, McGrath, Bonfils, Airtraq, Pentax AWS, LMA CTRACH. The recently introduced CMAC and the older Storz DCI and V-MAC were considered versions of the Storz Macintosh video laryngoscope for the purpose of this review and referred to as the V-MAC (video Macintosh) for the remainder of this review. Presence of an integrated channel (to guide placement of the endotracheal tube). The form of a videostylet (with the endotracheal tube placed around the device). A rigid blade laryngoscopes (without a channel, the endotracheal tube requiring some kind of independent stylet to guide placement). 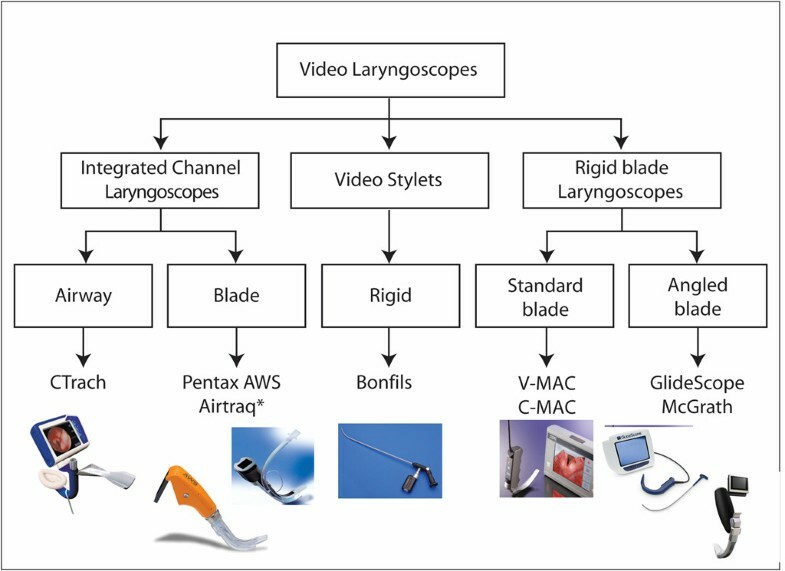 A classification of videolaryngoscopic devices. CTrach image courtesy of LMA North America. Pentax AWS image courtesy of Ambu USA. Airtraq image courtesy of Prodol Meditec S.A. Bonfils and C-MAC Â©2012 Photo Courtesy of KARL STORZ Endoscopy-America, Inc. GlideScope image courtesy of Verathon, USA. The McGrath series 5 image courtesy of Aircraft Medical, UK. Rigid blade laryngoscopes are sub-divided into those with a “standard” blade and those with an angled blade as classified by Niforopoulou and colleagues . There may be differences between the two types with respect to the glottic view on laryngoscopy and ease of intubation. Overall, we feel this classification scheme adds some clarity to the set of devices under examination. Clearly there are design differences between each device within these broad groups (for example presence of antifogging device etc.) Our classification is not novel as previous classifications of videolaryngoscopy have already been published [9, 11] but use different criteria to differentiate. This low incidence of difficulty encountered at direct laryngoscopy makes the study of true difficulty problematic. Our standard airway examination is a poor predictor of its occurrence [11, 97]. The data from a meta-analysis of 50,760 patients found that the positive predictive value (PPV) of the Mallampati score (at predicting a Cormack and Lehane view 3 or greater) to be 16% . Less than 1 in 5 of those subjects with a “positive” Mallampati score 3 or 4 actually had a Cormack and Lehane view of 3 or greater when DL was performed. Another study has suggested an even lower PPV for the Mallampati score . Consequently any study that solely uses the Mallampati classification to determine difficulty will have a very low incidence of true difficulty encountered at endotracheal intubation. The combination of the limited power of our current airway assessment methods to predict difficult direct laryngoscopy, with the multiple definitions of difficulty makes the subject classification a potential source of controversy. Our criterion for difficult laryngoscopy was a Cormack and Lehane view 3 and above; the definition provided by the ASA in the Practice Guidelines for Management of the Difficult Airway (2003) . We accept that this is a conservative estimate of difficulty, but this criterion actually returned relatively few articles specifically examining this finding at laryngoscopy. Unselected: this group of articles included subjects considered to have normal airways based on their airway examination and risk factors for difficult laryngoscopy. Even though this group contains a number of subjects that were proven during the study to have true difficult laryngoscopy, the outcomes were reported for the group as a whole and not specifically for this often-small subgroup preventing their specific outcomes to be analyzed. At Higher risk of difficult direct laryngoscopy: these articles included only subjects suspected to have an increased likelihood of difficult intubation because of one or more airway assessment test results or the presence of obesity (BMI > 35) or cervical spine limitation (collar or MILS). The data were reported for all those subjects fulfilling these criteria, irrespective of whether they were found to be good or poor direct laryngoscopic views during the study. As direct laryngoscopy was not performed before the videolaryngoscopy attempt the subjects had an unknown incidence of true difficult direct laryngoscopy (C&L >/= 3). Difficult direct laryngoscopy (C&L >/= 3): These articles included subjects with a documented Cormack and Lehane view III or greater on direct laryngoscopy before the intervention. Failed direct laryngoscopy: These articles included subjects upon whom direct laryngoscopy failed to achieve tracheal intubation. Before overall recommendations could be made regarding the efficacy of particular methods of VL, a measure of the quality of each study was made. This is particularly difficult regarding VL as the published studies consist of a mixture of observational (case–control and case series) with few actual randomized, controlled studies. The Agency for Healthcare Research and Quality performed a review of the many methods for assessing the quality of studies and found few that could be applied to both prospective randomized and observational studies . Following their recommendations the current review used the methodology developed by the Scottish Intercollegiate Guidelines Network . This method allowed non-analytical studies (eg. Case reports and case series) to contribute to the overall evidence (although at a much weaker score). Using defined criteria the methodological quality of each analytical study was made to give a quality rating (++ = good, + = adequate, - = poor) (Table 4). Of note, the SIGN methodology does not allow a quality assessment to be made for non-analytical studies. Each study was reviewed by 2 investigators (DH, OM) and entered into a standard data extraction table (Table 1). Where disagreement was found, this was discussed and consensus attained. Of note, a single study may appear multiple times in the data extraction table if multiple devices were investigated and data reported for each device. Evidence for one method of VL over another was presented as a level of evidence (Table 4) and then tied to a grade of recommendation in the discussion of these findings based upon the SIGN criteria  (Table 5). Reproduced from Harbour R, Miller J. A new system for grading recommendations in evidence based guidelines. BMJ (Clinical research ed 2001;323:334-6) with permission from BMJ Publishing Group Ltd. RCTs, Randomized controlled trials. Reproduced from Harbour R, Miller J. A new system for grading recommendations in evidence based guidelines. BMJ (Clinical research ed 2001;323:334-6) with permission from BMJ Publishing Group Ltd. The performance of a device when compared with direct laryngoscopy relies on three main outcomes: overall success, 1st time success, and time to successful intubation. Glottic view is a desirable outcome but intubation can remain successful and timely despite a limited view of the glottis, and in the case of VL a good laryngeal view does not ensure successful intubation. After careful review of the literature it was decided that little could be summarized or deduced from the Time to Intubation; this outcome being so variably defined between the studies as to make it useless as a form of comparison. We left the summary data from the outcome in the tables for completeness. Instead, we focused on overall success and first time success when compiling our evidence and recommendations, supplemented with information regarding the attainment of glottic view when possible. We followed the methodology developed by the Scottish Intercollegiate Guidelines Network  which was recommended by the Agency for Healthcare Research and Quality when assessing the strength of evidence provided by both prospective randomized and observational studies . As previously discussed, the success rate for standard direct laryngoscopy in a general, unselected population without airway pathology is likely to be greater than 95% . It must be noted that there is a difference between an improvement in laryngoscopic success (ie. achieving a view of the glottis) and success of intubation. Direct laryngoscopy is often successful, despite an inadequate view of the glottis. The review of videolaryngoscopy revealed an overall success rate for unselected patients of between 94 to 100% for all of the devices, which is similar to the high success rate of direct laryngoscopy. If used to lower the incidence of difficult intubation, videolaryngoscopy may have little to offer in this unselected patient population due to the low incidence of actual difficulty encountered. However, as we will later discuss, failure can occur during any intubation attempt and the utility of video laryngoscopy must be considered as an alternative intubation device when direct laryngoscopy fails. The performance benefit of videolaryngoscopy as an educational tool was not examined in the current review, but our opinion is that the techniques of videolaryngoscopy should be practiced in a normal population, and competency demonstrated, before attempting to use in a difficult laryngoscopic scenario. There is no current evidence to suggest an increased rate of traumatic airway complications compared with direct laryngoscopy in unselected patients although there are many case reports detailing injuries and hypotheses for their causation [101–108]. The lack of evidence for a particular device should not be interpreted as evidence against its use, but rather a weakness of the published evidence. When examining overall success the current review demonstrates a high rate of success when using the Airtraq, CTrach, GlideScope, Pentax AWS, and V-MAC videolaryngoscopes supported by level 1+ evidence (good prospective). There is weaker level 3 evidence (case series) to support the use of the Bonfils and Bullard. We found no evidence for the use of the McGrath in this clinical setting. Additionally, the review revealed level 1+ evidence (good prospective) for a higher proportion of Cormack and Lehane grade I views (compared to direct laryngoscopy) when using the Airtraq, CTrach, GlideScope, Pentax AWS, and V-MAC. The review revealed no evidence for the Bonfils, Bullard, and McGrath for the attainment of a higher proportion of C&L grade I views (compared to direct laryngoscopy). Given the above evidence, for those patients judged to be at risk of having a difficult laryngeal view on direct laryngoscopy we recommend the use of the Airtraq, CTrach, GlideScope, Pentax AWS, and V-MAC, by an operator with reasonable prior experience, to maintain overall success at intubation and increase the likelihood of Cormack and Lehane grade I views compared to direct laryngoscopy (grade A recommendation) based on the SIGN criteria  (Table 5). Such selection does not preclude the possibility of awake intubation in accordance with the ASA Practice Guidelines for Management of the Difficult Airway (2003). The current review demonstrates a high level of overall success when using the Airtraq, Bonfils, Bullard, CTrach, Glidescope, and Pentax AWS videolaryngoscopes supported by weak level 3 (case series) evidence. We found no evidence for success for the McGrath or V-MAC in this clinical setting. There is additional weak non-analytic evidence (level 3) to suggest that the use of the CTrach, GlideScope, and Pentax AWS results in an increased percentage of Cormack and Lehane grade I views of the glottis. This is in broad agreement with the previous review by Mihai et al. .Given the above evidence, for those patients with known difficulty direct laryngoscopy (C&L view III or IV) we cautiously recommend the use of the Airtraq, Bonfils, Bullard, CTrach, GlideScope, and Pentax AWS (grade D recommendation) by an operator with reasonable prior experience, to maintain the overall success rate of intubation based on the SIGN criteria . This particular recommendation must be considered with respect to the current ASA guidelines that recommend the use of a technique which maintains spontaneous ventilation if at all possible, in patients with known or predicted difficult laryngoscopy. After failure of initial direct laryngoscopy morbidity has been shown to increase when more than two attempts are made at laryngoscopy during emergency intubations performed beyond the operating room . Perhaps, given this finding, the Difficult Airway Society of the United Kingdom suggest in their failed intubation guideline, that a provider makes no more than 2 attempts with the same device before moving on to an alternative laryngoscopic device, with the maximum number of laryngoscopic attempts limited to 4 . The ASA guidelines currently do not define the maximum number of attempts with a particular device  but suggest that consideration be made to the use of an alternative intubation device if the primary device fails. The videolaryngoscopes would seem to fulfill the requirement of an alternative intubation device if an anesthesia provider is skilled in their use, and the device exhibits a high 1st attempt success rate. The current review demonstrates a high level of overall success, following failed intubation via direct laryngoscopy, when using the Airtraq, Bonfils, CTrach, Glidescope, McGrath, and Pentax AWS videolaryngoscopes supported by weak level 3 evidence (case series). We found no evidence for success for the Bullard or V-MAC in this clinical setting. There is additional weak level 3 evidence (case series) for a high first attempt success rate with use of the Bonfils and Pentax AWS in this setting. There is supplemental weak non-analytic evidence (level 3) to suggest that the use of the Airtraq, CTrach, McGrath, and Pentax AWS results in an increased percentage of Cormack and Lehane grade I views of the glottis after failed direct laryngoscopy. Given these findings we recommend use of the Airtraq, Bonfils, CTrach, GlideScope, McGrath, and Pentax AWS, used by an operator with reasonable prior experience, as an alternative intubation device following failed direct laryngoscopy (grade D recommendation) based on the SIGN criteria . There may be extra reason to consider use of the Bonfils or Pentax AWS given their high 1st attempt success in this setting (grade D recommendation). The use of the Mallampati classification as the predictor of difficulty at direct laryngoscopy is an oversimplification. We have presented Shiga’s work demonstrating that it is a very poor predictor of difficulty alone even when combined with other preoperative airway assessments. Unfortunately, the various predictors of difficulty at DL are variably presented in the literature, with Mallampati being the only consistently performed preoperative test. Studies examining patients with cervical spine limitation and obesity were included into the “at higher risk of difficulty group” as the authors and publishers considered these subjects to be at higher risk of difficulty. It is clear the ability of a laryngoscopic device to produce a good view of the glottis is a desirable characteristic of such a device. To allow some comparison between devices we considered a Cormack and Lehane grade I view of the glottis to be beneficial irrespective of whether it is obtained by direct or indirect means. This measure allows comparison between studies as a Cormack and Lehane grade I view is reliably recorded irrespective of whether the standard Cormack and Lehane, the various forms of modified Cormack and Lehane, or the Percentage of Glottic Opening is used in its assessment. Unfortunately the other grades of laryngoscopic view (grade 2, 2a, 2b etc.) are so variably recorded as to make other comparisons impossible. The limitation of using such a strict measure of glottic view improvement is the risk missing a lesser, but perhaps clinically significant improvement in glottic view afforded by device use, for instance an improvement from a grade 3 to a 2a view of the glottis. The concept of using the Cormack and Lehane classification when comparing direct laryngoscopy with the variety of methods of videolaryngoscopy is questionable. These grading schemes are designed and validated for direct laryngoscopy only; however, this measure is used throughout all of the studies, as no other alternate scheme exists. The actual difficulty in tube passage during videolaryngoscopy (unlike direct laryngoscopy) is often independent of the view obtained on the screen. Therefore, the description of the view found during videolaryngoscopy as a simple Cormack and Lehane view analogous to that found during direct laryngoscopy may be inappropriate as it doesn’t necessarily correlate with success. We suggest that during videolaryngoscopy a grading scheme that incorporates the difficulty encountered during passage of the endotracheal tube should be used. One simple method of grading this would be to describe the difficulty (easy, difficult, or failed) with a record of the glottic view obtained (modified Cormack and Lehane) followed by the name of the device. Difficulty could be defined by the performance of multiple attempts or the use of airway adjuncts to place the tube. For example, if the procedure is difficult but ultimately successful then this could be reported as a “Difficult Grade II GlideScope; rescued with the use of a tracheal tube introducer”. This information would allow decisions to be made if the use of a videolaryngoscope is contemplated at a later date, but also allow the different types of videolaryngoscopes to be more easily compared. These devices are “moving targets”, i.e. new designs are continually introduced and existing designs are modified. This makes studies of older designs sometimes of questionable applicability to those currently being sold. We considered the devices in the current review to not have changed in form or function to an appreciable amount in the study period. Where new videolaryngoscope blade shapes were introduced, but failed to fulfill the inclusion criteria, they were excluded from the analysis (example the CMAC “D blade” and King Vision™). The differences between the devices extend toward other design features, such as the presence of a heating element to prevent fogging of the view etc. These differences cannot be easily described in a simple classification scheme. Experience level and competency of the operators performing laryngoscopy was not presented or accounted for during analysis in any of the studies in the review. Instead the studies generally stated that the operators were appropriately trained and experienced in the procedure. Indeed, a simple expression of an operator’s number years in practice or number of previous successful intubations doesn’t provide a measure of the competency of a that operator in the use of a particular device. This is a serious limitation of the studies included in this review, which limits our conclusions and applicability of our recommendations. The current review was limited to device performance in appropriately experienced users. An improvement in the success of novices with the use of these devices was beyond the scope of this review. Any recommendations for their use must be considered in this context, and in the decision-making associated with a well-considered airway management strategy. When assessing the quality of randomized controlled trials particular emphasis is placed on the quality of the randomization process and blinding of subject and observer. Of these 2 factors, blinding is especially hard to address in a study design investigating videolaryngoscopy, and is generally poorly performed in the literature resulting in a universally poor score with respect to blinding. We found no article to which we could award the 1++ level of evidence class (excellent prospective). Randomized controlled trials may not be the best method of assessing the management of rare outcomes (such as true difficult laryngoscopy or intubation) or where blinding of operator to the device under study is impossible. Current methods to assess the quality of available evidence, outlined by the Agency for Healthcare Research and Quality (AHRQ) , are generally characterized as weighting their quality measures heavily towards randomized controlled trials. Relatively few of the methods suggested by the AHRQ actually allow observational retrospective studies to be included in any level of evidence summary. It is perhaps here where retrospective review of high quality outcome data in large databases generated by perioperative Anesthesia Information Management Systems (AIMS) can be particularly useful. Like many topics this subject likely suffers from publication bias and selective reporting within studies. In conclusion, we describe a field of research limited by poor subject classification and variable outcomes. We used a reasoned scientific approach to clarify and quantify the strength of evidence to support the use of some modern videolaryngoscopic devices. We found overall limited evidence of efficacy for many of the videolaryngoscopic devices. However, our review allowed us to produce the following limited recommendations: Firstly, in patients assessed to be at higher risk of difficult laryngoscopy we recommend the use of the Airtraq, CTrach, GlideScope, Pentax AWS, and V-MAC to achieve successful intubation (Grade A recommendation ). Secondly, in difficult direct laryngoscopy (Cormack and Lehane view III or IV on direct laryngoscopy) we cautiously recommend the use of the Airtraq, Bonfils, Bullard, CTrach, GlideScope and Pentax AWS to achieve successful intubation (Grade D recommendation ) used in accordance with the ASA practice guidelines for management of the Difficult Airway. Thirdly, additional evidence exists to recommend the use of the Airtraq, Bonfils, Bullard, CTrach, Glidescope, McGrath, and Pentax AWS following failed direct laryngoscopy to achieve successful intubation (Grade D recommendation ). Additional consideration should be made to use of the Bonfils and Pentax AWS given the evidence for 1st attempt success in this setting (Grade D recommendation). Future investigation would benefit from the precise qualification of study group airway characteristics, the use of consecutive rather than unselected subjects, the measurement and standardization of operator competency, the blinding of observers, and the standardization of outcome measures. These steps would reduce bias and help interpretation and metanalysis. Financial Support: All funding was solely from departmental sources. No external funding was solicited or used. This systematic review of the efficacy of videolaryngoscopy in orotracheal intubation classifies the patient groups under study into four clinical entities: unselected, at higher risk of difficulty, difficult direct laryngoscopy, and failed direct laryngoscopy. The evidence of efficacy is presented and recommendations are made. DH designed the review, extracted the data, summarized the findings, and composed the manuscript. OM extracted the data, summarized the findings, and contributed to the manuscript. DH summarized the findings. SK participated in the study design, reviewed the manuscript and coordinated the team efforts. All authors read and approved the final manuscript.